It wasn’t to be for the 36-year-old today. 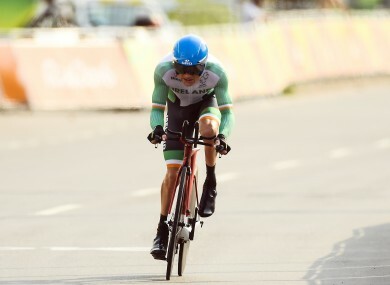 EOGHAN CLIFFORD’S BID to win his third Paralympic fell agonisingly short this morning as a mechanical failure during the sprint finish of the Men’s Road Race saw him finish fifth. In a nail-biting conclusion to the 70km race in Pontal, Clifford was part of a five-man breakaway but any chance of another podium finish was scuppered by a chain problem 200 metres from the line. From the delight of winning Time Trial gold at this venue on Wednesday comes the disappointment of missing out on adding another medal to his collection. “I felt pretty good coming into the sprint,” he said, “Particularly because I kind of lined myself up behind everyone because I need a run at it, I’m not very explosive but once I get up to speed I can maintain it. “I felt I was in with a good chance of a medal but just the chain came off, I wasn’t even changing gears, but it happens in bike racing. German Steffen Warias claimed gold in a time of 1:49:11. Ireland’s Colin Lynch finished 24th. Email “'I really felt I had a medal there': Mechanical failure costs Eoghan Clifford dearly ”. Feedback on “'I really felt I had a medal there': Mechanical failure costs Eoghan Clifford dearly ”.